The yard block of a container terminal is the central point of synchronisation for asynchronous container flows between the transport by deep sea vessels and the hinterland. The structure of the block stipulates that containers are stacked onto each other while only the topmost container can be accessed directly by a yard crane. This stacking restriction shapes the general framework of container handling in yard blocks. 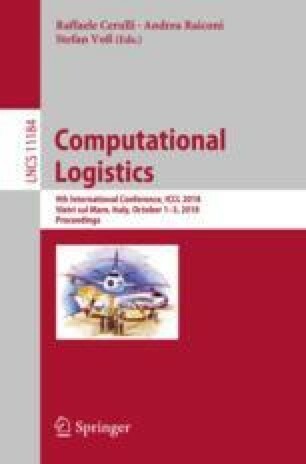 The optimisation of stacking configurations within a block has been a continuously growing stream of research in container terminal planning leading to a diverse set of problem definitions, modelling techniques and solution approaches. In this regard, an extensive literature review is conducted in this work surveying container handling problems in the time-span 1997–2018. For this purpose, the major handling problems and their versions are conceptually defined. Next, the surveyed studies are systematically classified and compared based on key properties for practical yard block planning as well as for a theoretical analysis of container stacking. Afterwards, the work is aligned with other literature reviews in this field and a conclusion is given in order to provide a comprehensive overview of container handling problems. Eventually, this should support the identification of open questions in existing problems and the initialisation of new research streams in future research. This paper is based on work also presented in (Covic 2018).